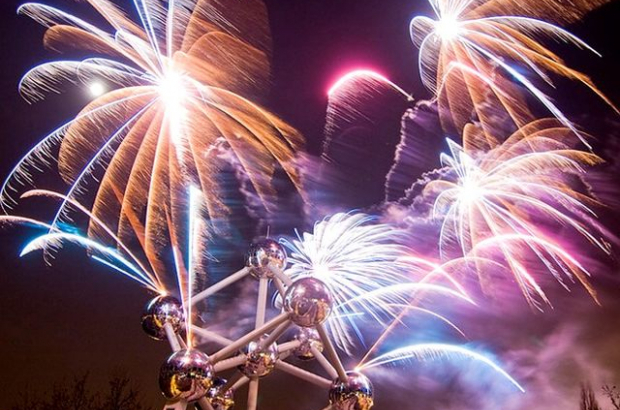 Back for a second year is the Fires of Laeken, spectacular fireworks displays between the Atomium and Palais 5 for five consecutive Fridays starting on 27 July. Each Friday will have a different theme, this weekend it’s Atom’Circus. It will bring an aura of magic to the Atomium in homage to the year of the circus. From 18.00-21.00, there will be clowns, balloon artists, stilt-walkers, giant soap bubbles, face-painting workshops and a bouncy castle. A tent will house workshops to teach balancing acts and magic. Original street art walkabouts and distorting mirrors will add to the fun. Then from 21.00-23.00, the atmosphere will warm up with fire artists, acrobats and fortune tellers. At all times, hungry people will be able to enjoy pizzas, pasta boxes, cold meat platters, paella, candy floss, popcorn, churros, toffee apples and more from the many food trucks. There will be gypsy music to entertain visitors and at 23.00 it’s time for the fireworks, which, if last year is any indication, will be spectacular. Every weekday in July and August, it's Midi Minimes at the Royal Conservatory - very inexpensive but high-quality midday concerts. This Friday its Lucid Duo, two marimba players of extraordinary virtuosity playing transcribed pieces by Abe, Golinski and Chopin. On Monday it’s string quartet Girard playing 19th century music: Saint-Saëns and somewhat unknown but supremely gifted Belgian composer Guillaume Lekeu. On Tuesday string quartet Akilone plays Mozart and on Wednesday string quartet Malibran plays Stravinsky and Prokofiev. Finally on Thursday Rusquartet plays Tchaikovsky. Next week it’s jazz, piano, early music and Beethoven. This event doesn’t take place until 19 August but it usually fills up early. The Villa Empain has what is probably the most beautiful and largest private outdoor swimming pool in Brussels and this will be the third edition of their Summer Party. It's the perfect opportunity to discover or rediscover the current exhibition with friends and family during a festive afternoon filled with culture, music, sunshine and poolside drinks. From 16.00 the swimmers of Brass will present their entrancing aquatic performances and Darko will DJ, echoing the Boghossian Foundation’s mission of being a centre for art and dialogue between Eastern and Western cultures. Here’s what sounds like another fun evening this Friday from 19.00 at Fermenthings: “Growing hops in Brussels? That was the crazy bet from Christophe. We’re giving a boost to a local effort by tasting his beers, feasting around a nice home-barbecue and chatting with the founder of the Houblons de Bruxelles. This monthly meet the brewer event will be a little bit different as Christophe only brews five beers at the moment." Reservations are encouraged and there will be a big barbecue. The Warwick Hotel, just a few steps from the Grand-Place, has a nifty little rooftop bar that most people don’t know about. It’s open for the summer with fabulous views of the skyline and the square itself, as well as wonderful sunsets. This summer, the last pop-up of the Royal Museum for Central Africa, before it reopens at the end of the year, will take place in Egmont Palace. This is a great opportunity to see the magnificent interiors. In this temple of diplomacy the exhibition aims to lift the veil on what the new museum will or could look like and to promote openness and willingness for dialogue. The exhibition will bring collection pieces of the museum into dialogue with contemporary art works. If you haven’t been to the Guinguette Maurice in Cinquantenaire Park yet, and you’re an aficionado of Fifties American dancing here’s a great way of discovering its charms. This Saturday afternoon they are going to teach you the basics of the Boogie-Woogie, which is often characterised as the dance that became rock ‘n’ roll. The lesson is from 17.00-18.00 and then from 18.00-20.00 everyone takes to the (wooden) dance floor for Boogie and Rockabilly. On Sunday evenings through the summer and autumn, La Finca in Wezembeek-Oppem is offering a pick-your-own experience at their organic vegetable and fruit gardens. Their staff will guide you and armed with a small knife or scissors and a basket you will pick what you please and then pay for it before putting your harvest into the bags you brought with you. Reachable by bicycle, tram and car. Cinéma Galeries is back at Brussels Beach with free outdoor screenings in what they call the Summer Hour Festival. Each year a selection of movies is programmed to discover the unique atmosphere of an international city. This year it’s Rio de Janeiro. The festival is every Thursday, Friday and Saturday until 12 August and screenings are at 22.00. More open air free summer cinema - this time in Forest with Le retour du héros - “an exhilarating comedy set in the Napoleonic era” starring Jean Dujardin. It’s in downtown Forest near the abbey and the stores on Place Saint-Denis will be open to provide food and drink. Another place to discover: Kanal, Brussels’ new contemporary art museum, which is aborning in the Citroën complex along the canal. It’s a unique experience as the public is invited in while the institution is being developed so the place is different at every visit. Recently they added Kanal Store, a pop-up store dedicated to Belgian creation in fashion, jewellery and interior design accessories. To complete the shopping/art/architecture experience, steps from Kanal Store is Kanal Street Food Market with food trucks such as Pistola, Wild and Le Bar à Vins. Autoworld, Belgium’s national car museum, charts the history of the motorcar since 1896 in an impressive historic building in the middle of Cinquantenaire park. It’s popular all year round with 250 vehicles on permanent display. This summer, Autoworld celebrates the 120th anniversary of one of the great French car brands: Renault. More than 50 vehicles will tell the story of Renault, a story inseparable from that of 20th century France and industrialisation. It was in 1898 that Louis Renault built his first car in a workshop at the back of his parents’ house – and orders soon came flooding in. On display will be the most emblematic cars of the brand, including the Type A of 1899, the first closed car in history.